I read the Joachim Neugrochel translation of this story. I have been reading a collection of short stories by Franz Kafka. The famous author tends to dwell upon common themes. His tales often reflect the alienation of the individual from family, religion, humanity and society. They also commonly express bewilderment in the face of the modern world. His tales often also include an element of the fantastical and the absurd. The stories are often weird or uncanny in a disturbing way. Less famous than some of his other works, A Report For an Academy is a short story that looks at society, individualism and behavior in a highly critical light. 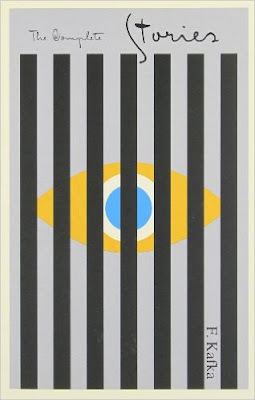 Like many other Kafka works, it is strange, interesting and thought-provoking. The story is presented as a speech given by an individual known as Red Peter in front of an unnamed academy. Within the first few paragraphs, it becomes apparent that Red Peter is an ape who has been educated and has reached human intelligence. How and why Red Peter achieved what he did is the crux of his speech. The speaker was captured by a zoological expedition hunting for live specimens. Caged and treated with brutality, Red Peter began to intuitively grasp that the only way to escape captivity and ill treatment was to imitate humans and conform to a certain set of behaviors. Eventually people realized that Red Peter was sentient, and they began to treat him like an equal. The process was difficult, as Red Peter had to adopt certain behaviors that were counter to his nature. He found some of the behaviors to be abhorrent and harmful, such as consuming alcohol. He goes on to talk about the self-suppression of his nature. Obviously, this story has a lot to say about an individual’s place in the world. In order to live in society and be allowed a degree of personnel autonomy, we must conform and make compromises. Kafka goes very hard on this pattern of behavior that all humans, to some degree, must follow. Kafka wrote dark stories, and he tended not to see much positive in the world. My take is that that this story only presents part of the picture. Living with others and conforming to certain precepts of society is necessary not only for an individual to function, but it is often the ethical thing to do. Much of social behavior is about respecting of other peoples’ rights, empathy towards others and common decency. Kafka does not consider such issues in this story. Had he done so, I think that this would have been a balanced exploration of these issues. However, Kafka is just not the kind of writer to look at life in this way. With all of that, conformity in many other contexts can be a terrible thing. Religion, tradition and other social pressures can lead to all sorts of irrational and unethical behavior. It can crush an individual’s spirit as well as an individual’s ability to think for oneself. In some situations, forced conformity harms the individual and society. These malevolent effects are best highlighted in this story by Red Peter’s adaption of drinking alcohol. Kafka is such an interesting writer. His short stories can be both challenging and disturbing. Though he is very negative and dark, he is also thought-provoking and his critiques upon society contain a lot of truth. Even if one is not completely onboard in regards to his outlook upon the world, his stories are often well worth reading. 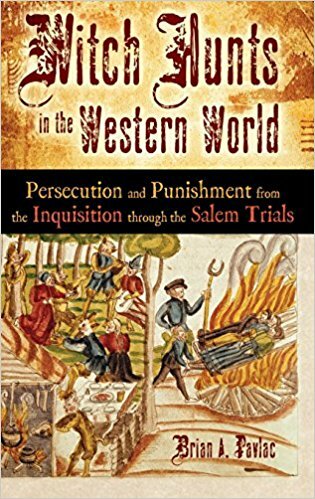 Witch Hunts in the Western World by Brian Pavlac is a comprehensive account of the witch hunts that occurred in Europe and America. This is a nuts and bolts, serious chronicle of events. It is very balanced. The history of witch hunting as it occurred in Europe and America is chronicled. Many individual cases are examined. The ideology behind witch hunting is also detailed, as is the ideology that was espoused by its critics. This book is light on analysis, however. Witch hunting mostly occurred between 1400 and 1800. It usually originated on the local level. Although the hunts were sometimes taken up by national and religious leadership, a higher level authority more often than not tended to stop or slow the persecutions. It was mostly women who were accused. However, there were some hunts that involved even numbers of men and women and a few that targeted mostly men. The accusations usually involved the use of magic as a means to harm others, as well as consorting with the devil, demons or other witches in various ways. The accused would often be tortured. Under torture, the victims often implicated many others so the circle of accused witches grew. Thus, while some persecutions involved only one or two individuals, others turned into mass hunts involving hundreds of people. Those convicted were often, but not always, executed. People were often burned alive. This book details one story after another of brutal torture and execution. Thus, many readers will find this work disturbing. War, religious arguments and other social pressures often helped to kindle the fires. Many scholars and religious leaders supported the persecution. Multiple books and tracts were written that encouraged it. However, others opposed it. Some famous thinkers were opponents who spoke and wrote against it. Rene Descartes and Erasmus were among the notable opponents. The author writes of Descartes. This book reads a little bit like a textbook. Pavlac does not embellish his writing much. There is a little analysis, but it is fairly sparse. One interesting thing that the author does is that he briefly surveys various theories on the underlying cause of these historical events. He does explain which theories he favors and why he favors them. Pavlac sees the changes as originating in variations in ideology. With that, the analysis here is sparse. I wanted to know more. Despite the author’s clear intent to provide a balanced, unbiased view, the text could have dug deeper into the underlying causes of these events. 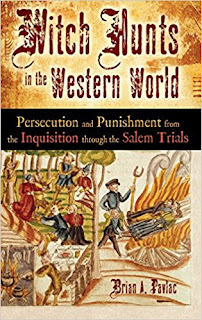 I chose this book as I was looking for general history on witch hunting in Europe and America. Several historians had either written or told me that many of the popular books out there contained poor research or were too agenda driven. This book was recommended as one of several good sources. This is a good book for a reader who wants to know the facts related to witch hunting in Europe and America. I learned a lot from it. With that, it seems primarily aimed at students and academics. Folks looking for an engaging read might want to look elsewhere. For those who are very interested in the subject, this book as part of a broader reading plan is invaluable for its completeness and objectivity. I recommend this work for readers who are so inclined. The Eustace Diamonds by Anthony Trollope is in many ways a great book. My general commentary on the work is here. However, I want to write a few words concerning something that is not so great about it. The novel contains a nasty streak of anti-Semitism. First, I will note accusations of bigotry and sexism against authors of older works is fairly common. Sometimes these accusations are based on statements or actions that an author committed or made that are not directly related to their writing. In other instances, such charges are made based on subtle or scant evidence. Joseph Conrad has been accused of racism based on his novella Heart of Darkness. At the very least, the purported racism inherent in Conrad’s book is far from clear and open to debate. Sadly, the anti-Semitism in the Eustace Diamonds is in the text, and it is far from subtle. In the book, several characters who are Jewish are described using negative and despicable stereotypes. The portrayal character of Mr. Emilius is an unfortunate example of this. Mr. Emilius is an Anglican preacher who was formerly Jewish. Again and again, he is portrayed as being endowed with the worst Jewish stereotypes and is portrayed as “greasy,” “oily,” and as a liar and a conniver. The Jewish character of Mr. Benjamin is also portrayed using similar odious stereotypes. The word ‘Jew’ is used numerous times in the text, usually paired with negative or disparaging language. One can argue that anti-Semitism was a product of the times that Trollope was writing in, but there are some facts to consider. Other writers and thinkers who were contemporaries of Trollope vocally opposed anti-Semitism. In Our Mutual Friend, Charles Dickens spent many pages defending Jews and criticizing anti-Semites. Friedrich Nietzsche, in multiple essays, threw his trademark scorn at anti-Semites and defended Jewish people. These are just a few examples. With that, when it comes to reading older works, it is not uncommon to encounter bigotry, sexism and indefensible beliefs. The Old Testament, The Koran and much of Greek literature contain misogynistic and homophobic passages and are often pro-slavery. William Shakespeare’s The Merchant of Venice was terribly anti-Semitic. More recently, H.P. Lovecraft’s stories contain some overtly racist passages. The list of examples of this sort of stuff is lengthy. However, I must admit to being extra disappointed in Trollope. Having read quite a few of his novels, these passages not withstanding, his books often embody wisdom and balance. Even when he seems to support institutions and social conventions that I find questionable, he does so in a moderate way. He seems to show understanding for people and ideas that are different. He often shows sensitivity towards women’s issues. The basic morality that he conveys in his books seems solid. For all of these reasons, this ugly streak of anti-Semitism is especially surprising and disconcerting. These passages are part of the text. One of the many functions of novels is that they allow an author to communicate ideas. Such ideas are fair game for analysis and criticism. This is a set of ideas that Trollope includes in this book that are odious and should be identified and commented upon as such. It is important for those of us who like Trollope and admire other values that he espouses recognize this shortcoming and acknowledge that this set of ideas is terrible. I believe that we need to look at literature through a critical lens. This means analyzing a book’s contents, celebrating the good, criticizing that with which we disagree and calling out the truly awful. 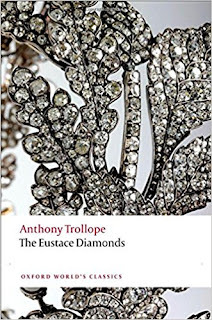 The Eustace Diamonds is the third novel in Anthony Trollope’s Palliser Series. This is a huge book with lots of characters and multiple plot threads. At its center is the impressive literary creation of Lizzie Eustace. Though in some ways similar to other Trollope novels, I found this book to be much more cynical and dark when compared to the author’s other efforts. Lizzie is a beautiful young woman who marries the wealthy Sir Florian. When her husband dies, a dispute arises over the disposition of the very valuable Eustace Necklace. Sir Florian’s family claims it as a family heirloom and considers it the property of the family. Lizzie, on the other hand, wants to keep the jewels for herself. A good part of the narrative concerns itself with Lizzie’s battles against the Eustace family for control of the necklace. It also encompasses Lizzie’s many romantic entanglements. There are multiple additional plot threads that become entwined with Lizzie’s life. One particularly important one is the troubled engagement between Lizzie’s cousin, Frank Greystock, and the poor, unassuming but virtuous Lucy Morris. Lizzie is not a typical Trollope heroine nor is she a typical Trollope character. Though often presented in a humorous way, Lizzie can be described in modern terminology as a sociopath, a narcissist, a hypocrite, a manipulator and a pathological liar. Lizzie cheats people out of property, commits fraud, manipulates people around her, tries to seduce multiple men at the same time and is vengeful, to just name a few of her faults. She tells lie after lie after lie. She lies to inflate her own importance. She lies for personal gain. She lies to make herself seem like a victim. She lies for revenge. She even admires others when they lie well. Despite her villainy, Lizzie is interesting and amusing to read about. Her confrontations with other characters range from serious drama to hilarious clashes. She tries to dominate most of the people around he, but she is also attracted to dominant and reckless men. She extolls the qualities of poetry, but her appreciation for it is superficial at best. Lizzie is an expert manipulator. Though some of the characters see right through her, others are fooled into believing that it is she who is a victim. She flirts and enchants a series of men. She is constantly pursuing Frank Greystock, despite the fact that they are both engaged to other people. One interesting thing about Frank is that he mostly recognizes Lizzie’s flaws, but he cannot help himself as he is still enticed and tempted by her. This is typical of Lizzie’s skills of influence. Throughout the book, he is fighting her pull. I have read Trollope’s entire Chronicles of Barsetshire, The Fixed Period and the two prior books of this series. Lizzie is different from any other character that Trollope presents in the other books. Almost all of his fictional personas have shades of good and bad. Lizzie is different in that she is irredeemable. Even the incredibly domineering, controlling and hypercritical Mrs. Proudie of The Chronicles Of Barsetshire showed some humanity. This work is darker in other ways. Most other Trollope books portray some characters doing terrible things. The author has created some very unlikable characters in many of his books. However, those works do not contain as many immoral people with such intense flaws as are in this novel. Lizzie is surrounded by opportunistic and narcissistic people. One example is the engaged couple of Lucinda Roanoke and Sir Griffen Tewett. The pair decides to marry for reasons of personal gain. The moody, sarcastic and cynical Lucinda hates the boorish and nasty Sir Griffen. The two display open contempt for each other as their marriage plans proceed. They fight like cats and dogs and even manage to assault one another prior to their wedding day. All of this sounds like a dark story. Thematically it is. However these situations, while presented as being ultimately serious, are more often than not presented in a humorous and, at times, hilarious manor. As this cast of bizarrely flawed characters clash and conflict with one another and with the world at large, their antics provide one entertaining anecdote after another. 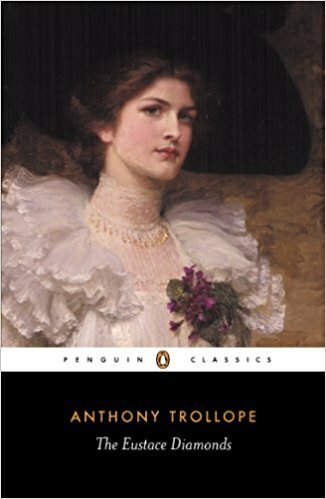 Trollope displayed some cynical wit in the other books that I have read, but never to the degree that it is displayed in this book. This is a very funny work. Trollope’s books all contain a moral center. Despite the turn to darker themes here, this core is still present. Here, morality is mostly represented by Lucy Morris. She is a virtuous and ethical woman. Her fiancé, Frank Graystock, neglects her terribly. Lucy is hurt by this treatment but continues to act with nobility and grace. Near the end of the book a confrontation between herself and Lizzy reinforces Trollope’s ethical view of the world. With all of the terrible behavior displayed by so many of the characters, and the unblemished virtue of Lucy, I found the characters in this book to be more simplistic than the usual Trollope fare. Frank Graystock, who is very flawed but who does the right thing in the end, is this novel’s most complex character. As nasty as some characters in this book are, they are still unique, interesting and often very funny. However, in the end, I thought that this work was less nuanced than other Trollope books that I have read. What it lacks in complexity, it partially makes up in humor however. This is the funniest Trollope novel that I have read so far. As noted above, this novel is a little different from many other Trollope books. Nevertheless, it is infused with Trollope’s superb writing traits, including his trademark meta-fiction style, interesting and funny characters, great dialogue and many other things to earn recommendation. While it can be read as a stand alone book, I recommend at least reading the first two Palliser books first for full effect (There are crossover characters between these books and The Chronicles of Barsetshire, thus the two series together can be viewed as one giant series. My recommendation, for completeness, is to read both of the series, in order). Ultimately, this is an extremely entertaining novel that I highly recommend for both Trollope fans and general fans of Victorian literature. My commentary on the first book of the Palliser Series, Can You Forgive Her? is here. My commentary on the second book of the Palliser Series, Phineas Finn is here.